What? Holy Wazowski! Seriously, you can cruise out of Los Angeles on the Disney Wonder, visit San Francisco, San Diego, Ensenada, Mexico, and spend 7 magical nights with the Pixar characters for $599 per person. Cruise dates are 9/16, 9/23, 9/30, 10/7, and of course there are details and restrictions, yada yada yada. You can click here for the details. Pixar Presentations and Sneak Peeks: Artists and filmmakers from Pixar Animation Studios will provide an inside look at the creative process used to develop an animated feature which includes a look at the making of Pixar’s newest release “Brave” and a sneak peek at footage of future Pixar films. The Art of Pixar: Storyboards, character sketches and other inspiring concept art used to design Pixar films will be on display in a special art exhibition at sea. This collection of art has only been seen outside of Pixar Animation Studios when displayed at leading art museums around the world. Pixar Film Fest: Guests will be able to enjoy the entire Pixar library of films while onboard, including a selection of delightful animated shorts. The voyages coincide with the theatrical premiere of “Finding Nemo 3D,” which Guests can enjoy at either of the two theatres equipped with state-of-the-art Dolby 3D projection systems. 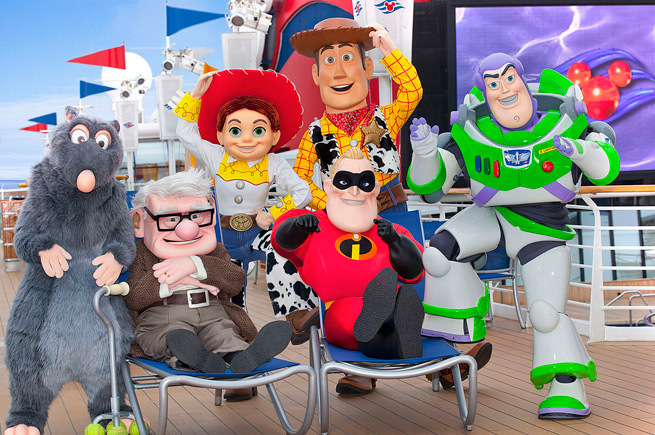 Pixar Character Encounters: For the first time, more than a dozen Pixar characters will meet with and greet guests throughout the cruise including Mr. Incredible, Remy, Woody, Jessie and Buzz Lightyear. There will be a special Pixar-themed dance parties and a host of other opportunities to reconnect with favorite Pixar pals. Special Gift: Sailing Guests will receive a commemorative lithograph created by Pixar artist and “Brave” co-director/screenwriter, Steve Purcell. Come on, you can’t miss this! Complete the form below to get your planning started with MouseChow!